A website, unlike a newspaper or magazine, cannot be physically placed in the hands of your target audience. To reach these viewers, you must actively draw them to your website. For many people, this can be a difficult undertaking. Search engines make use of complicated algorithms and criteria to determine the order in which pages will be returns to users. Having your website listed closer to the top on search engine results will lead directly to more traffic to your website. This, in turn, will generate more revenue for you in the form of ad clicks, direct sales, or publicity for your product or service. With many people fighting over top search engine placement, what is the best strategy to get your site to the number 1? 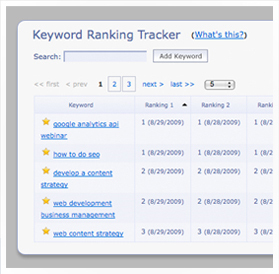 The secret lies within keyword ranking. When a search engine looks through the internet and ranks pages, it will compute a weight and value for the keywords that are listed for that site. These results are then returned to users when they search for a specific item or topic. One option for improving your rank is to contact a professional search engine optimization, or SEO, firm. These companies will be able to carefully analyze your current website in every category, and then make systematic and carefully engineered changes in order to improve where it shows up in search engine results. While these services are not always cheap, they can lead directly to increases in revenue and profit for you, so this is a very important option to consider. When writing your web page, it is important not to overuse words, as this can serve to "dilute" your results in the search engine database. Search engines make use of highly sophisticated programs these days, and they are designed to detect and avoid sites that clearly attempt to draw users in with meaningless fluff. This makes it extremely worthwhile to contact a professional, who is familiar with the manner in which these programs work, and can guide you in working within the framework that is currently laid out. If you're simply hosting a personal webpage or blog site, search engine results might not be as important to you. However, if your site promotes items for sale, services, or generates revenue from banner programs, you stand to gain quite a bit by moving your site up on the major search engines. Most SEO firms will be happy to speak with you about the options that are available, and can effectively accommodate your needs, whether you're seeking a small increase in traffic or a massive overhaul. There is indeed a science to this process, so it makes perfect sense to seek the help of an experienced pro to help you. Don't be afraid to send some emails and make phone calls to find out what options are available to you. You just might end up with the next groundbreaking trend in internet marketing!